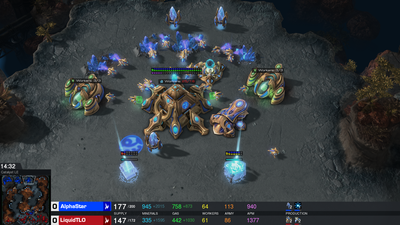 A visualisation of the AlphaStar agent during game two of the match against MaNa. This shows the game from the agent’s point of view: the raw observation input to the neural network, the neural network’s internal activations, some of the considered actions the agent can take such as where to click and what to build, and the predicted outcome. MaNa’s view of the game is also shown, although this is not accessible to the agent. AlphaStar’s behaviour is generated by a deep neural network that receives input data from the raw game interface (a list of units and their properties), and outputs a sequence of instructions that constitute an action within the game. More specifically, the neural network architecture applies a transformer torso to the units (similar to relational deep reinforcement learning), combined with a deep LSTM core, an auto-regressive policy head with a pointer network, and a centralised value baseline. We believe that this advanced model will help with many other challenges in machine learning research that involve long-term sequence modelling and large output spaces such as translation, language modelling and visual representations. As the league progresses and new competitors are created, new counter-strategies emerge that are able to defeat the earlier strategies. While some new competitors execute a strategy that is merely a refinement of a previous strategy, others discover drastically new strategies consisting of entirely new build orders, unit compositions, and micro-management plans. For example, early on in the AlphaStar league, “cheesy” strategies such as very quick rushes with Photon Cannons or Dark Templars were favoured. These risky strategies were discarded as training progressed, leading to other strategies: for example, gaining economic strength by over-extending a base with more workers, or sacrificing two Oracles to disrupt an opponent's workers and economy. 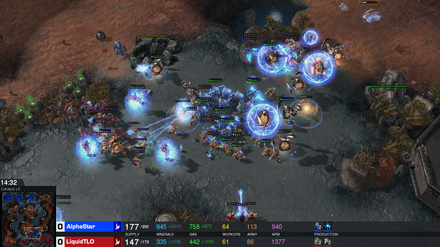 This process is similar to the way in which players have discovered new strategies, and were able to defeat previously favoured approaches, over the years since StarCraft was released. As training progressed, the league creating AlphaStar changed the blend of units that it builds. Interactive visualisation which shows the competitors of the AlphaStar league. The agents that played against TLO and MaNa are specifically labelled. 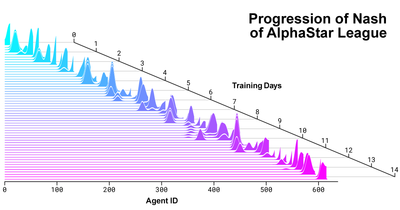 The neural network weights of each agent are updated by reinforcement learning from its games against competitors, to optimise its personal learning objective. The weight update rule is an efficient and novel off-policy actor-critic reinforcement learning algorithm with experience replay, self-imitation learning and policy distillation. 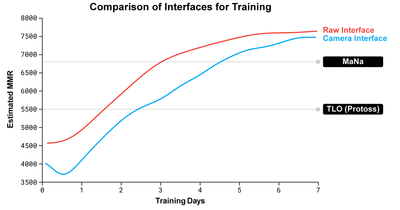 The figure shows how one agent (black dot), which was ultimately selected to play against MaNa, evolved its strategy and competitors (coloured dots) during the course of training. Each dot represents a competitor in the AlphaStar league. The position of the dot represents its strategy (inset), and the size of the dot represents how frequently it is selected as an opponent for the MaNa agent during training. 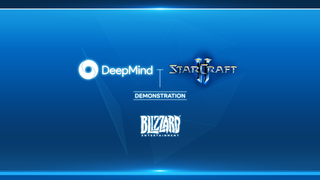 In order to train AlphaStar, we built a highly scalable distributed training setup using Google's v3 TPUs that supports a population of agents learning from many thousands of parallel instances of StarCraft II. 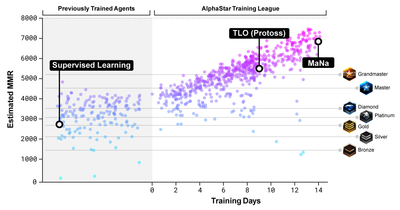 The AlphaStar league was run for 14 days, using 16 TPUs for each agent. During training, each agent experienced up to 200 years of real-time StarCraft play. The final AlphaStar agent consists of the components of the Nash distribution of the league - in other words, the most effective mixture of strategies that have been discovered - that run on a single desktop GPU. 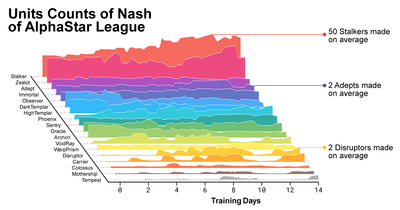 The Nash distribution over competitors as the AlphaStar league progressed and new competitors were created. The Nash distribution, which is the least exploitable set of complementary competitors, weights the newest competitors most highly, demonstrating continual progress against all previous competitors. 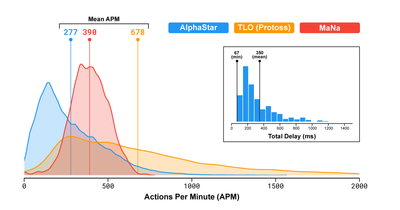 Performance of AlphaStar using the raw interface and the camera interface, showing the newly trained camera agent rapidly catching up with and almost equalling the performance of the agent using the raw interface. 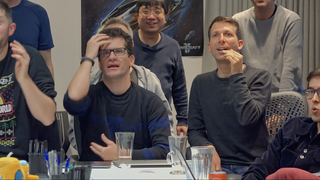 Ali Razavi, Daniel Toyama, David Balduzzi, Doug Fritz, Eser Aygün, Florian Strub, Guillaume Alain, Haoran Tang, Jaume Sanchez, Jonathan Fildes, Julian Schrittwieser, Justin Novosad, Karen Simonyan, Karol Kurach, Philippe Hamel, Remi Leblond, Ricardo Barreira, Scott Reed, Sergey Bartunov, Shibl Mourad, Steve Gaffney, Thomas Hubert, the team that created PySC2 and the whole DeepMind Team, with special thanks to the research platform team, comms and events teams.